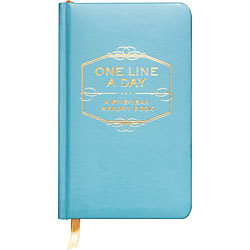 One line a day... sounds kind of like my monthly resolutions, right? Except, of course, that it pretty well blows the 30-day-requirement out of the water. One thousand eight hundred and twenty-five days (1825) is a lot to commit to. But just one line? Sounds - doable, if not reasonable. I want. Even though "I'd like to have" is much more polite. ps - an only-slightly-related note: this gal (with whom I pine to be friends - maybe our move to Vegas will facilitate that?) also loves it.